I adore Anthony Bourdain's shows. I love to see his excitement and his lustful look when he is about to devour Guinness, his pork sausages, especially blood sausages or any pork products, and noodles! The other night, his show was on Borneo, after a quick stop in Singapore, the Disneyland of street food. He was chowing away on all kinds of noodle, Malay fried noodle, Laksa, etc. Oh, how I wish I had some noodles right now, but making noodles and eating at 10 pm. is unreasonable even for me. Today, I have some crispy duck leftovers from our brunch this morning, as well as some cucumbers, green onions, pickled red onions and jalapeno (see my post "Easy Peasy Crispy Duck"). I can use these ingredients to make some kind of noodle. I am determined to make teriyaki duck noodle for my dinner. I search my pantry and find a bag of dried sweet potato noodle, the kind that Koreans use to make chop chae. I love its slippery, chewy texture. First I set out to make teriyaki sauce. I realize that I do not have any ginger. I can't make teriyaki sauce without ginger!! Not to worry, there is a bottle of Trader Joe's Soyaki in my pantry. This is perfect. I will get to eat teriyaki noodle after all. I cook about 8 oz. of sweet potato noodle (half of a 16 oz. package) in a big pot of boiling water until soft but still with a chewy texture (follow instructions on the back of the package). Once cooked, I drain the noodle and put it in a big mixing bowl with 1/2 cup of Soyaki teriyaki sauce. Once the noodle cools down a bit, I add about two cups of julienne vegetables (cucumber, green onion, carrot), Chinese chili pepper in oil, and chopped cilantro. Mix everything together very well. 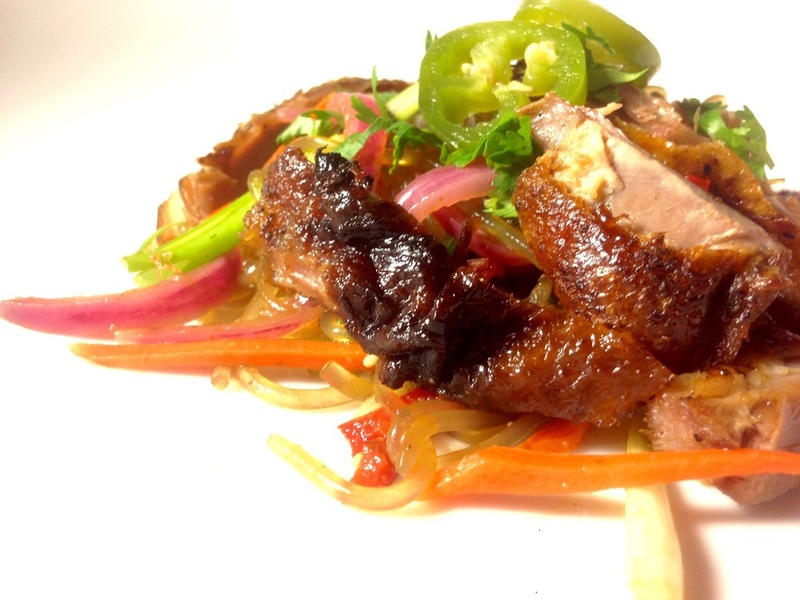 I serve myself a pile of glistening noodles topped with pickled red onions, jalapenos, and last but not least the crispy salty duck pieces. That does take the edge off my cravings and I still have enough leftovers for my lunch tomorrow :).